Re-Play's Teething Keys are bright, colorful and fun! Featuring 3 unique shapes in 3 bold colors. 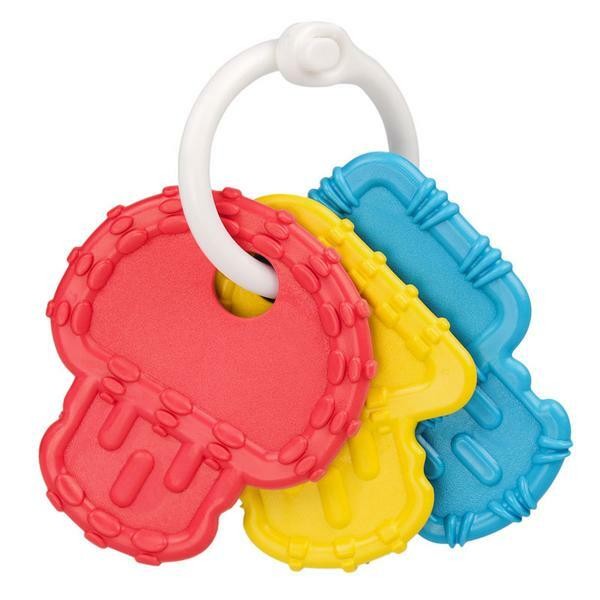 All Re-Play Teething Keys are made from recycled milk jugs (HDPE recycled plastic), so not only are they better for your child, they are better for your environment! Approx. dimensions: 2.5" by 3" by .25"
Each product is designed with early eaters in mind. From divided plates with deep walls, to spill proof sippy cups with our patented No Spill valve, our goal is to make the self-eating process easier and more successful. The thickness and durability of our product designs have been proven to last families through multiple children. You can even run over our divided plate with a car without causing damage! The source plastic is specially selected and cleaned to meet FDA strict purity standards. So we are confident it will meet yours. Each product is third-party tested. Like most plastics (and melamine,) Re-Play is dishwasher safe and should NOT be used in the microwave. Our color concentrate is safe for food contact, and all ingredients in the colors are FDA approved. Our products are made from recycled HDPE, which is a #2 plastic. HDPE is also BPA-free, Phthalate free, and PVC free. Because it’s made from #2 plastic, HDPE basically means milk jugs! It’s one of the easiest plastics to recycle, and it can be recycled again and again. So drink your milk and toss that jug in the recycling bin!